Although I could do without the snow and single digit temps I do love winter because a lot of my favorite clothes are winter clothes. There's something about a cozy sweater that makes me feel good so of course I'm loving the current trend of statement sleeve sweaters. With trends I really have to be careful to control myself, especially with these because it's a style I REALLY like. Without the little voice in my head reminding me that I do not need a closet of practically identical pieces I would own several of the tiered sleeve sweaters, thank goodness for that voice! For the tiered sleeve look I went with black because it's versatile and since this is such a trendy piece and there's no guarantee this will be in style come next winter I wanted something I would get a lot of wear out of this season. Likewise when buying a bell sleeve cardigan I wanted something I could wear throughout winter and possibly into spring - this sweater with jeans and a comfy tee underneath has practically become my winter uniform. 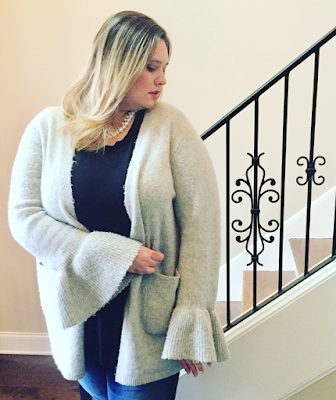 Since we're looking at a few more months of cold weather there's still time to get some fun sweaters of your own and get plenty of wear out of them this season - I've linked a few of my favorites below. For the comfy tee layer, I cannot recommend the sweet tees from Lauren James enough! Everyone seems to find it odd that I get soooo excited over a t-shirt . . . until they wear one and then it's ohhhh, I get it. You can get $10 off a purchase through this link.